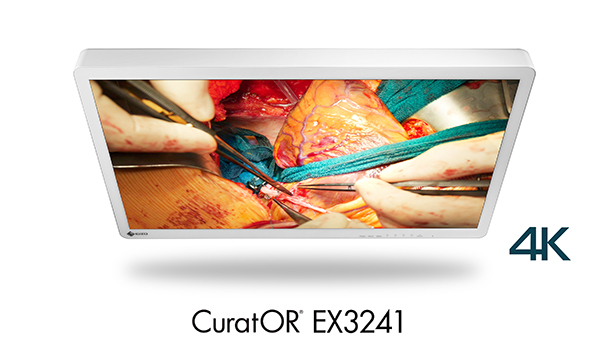 EIZO Corporation announced the release of the CuratOR EX3241 – a 32-inch, 4K UHD (3840 x 2160 pixels) surgical monitor with high brightness, image sharpening technology, and optical bonding for clear and accurate viewing of endoscopy and microsurgery images. The EX3241 features 4K UHD resolution with high brightness. It is equipped with an energy efficient LED-backlit LCD panel producing a maximum brightness of 700 cd/m2, reproducing 4K endoscopy and surgical microscope images in high resolution and high brightness. Furthermore, using EIZO’s Smart Resolution with Sparse Coding (S.R.S.C) proprietary technology, full HD images can be enhanced to a 4K resolution without any lag, making full use of the monitor’s 4K resolution. EIZO, which means image in Japanese, is a visual technology company that develops and manufactures high-end display solutions. EIZO integrates hardware and software technologies with consulting, web hosting, and other services to help customers in business, graphics, gaming, medicine, maritime, and other fields work more comfortably, efficiently, and creatively. Headquartered in Hakusan, Japan, EIZO has R&D and manufacturing facilities in Japan, China, Germany, and the US, and representation in more than 80 countries.